Does a “bad” relationship between fungi and ants exist anywhere? Of course, organisms don’t always have a good relationship, including other species of ants and fungi. One bad relationship is the fault of an organism called the “zombie-ant fungus.” This parasitic fungus changes the behavior of a tropical carpenter ant, Camponotus leonardi, found in the rainforest canopy of Thailand, causing the ants to become zombielike and die in a place that’s advantageous for the fungi’s reproduction. It’s a process straight from a science fiction story: The fungus actually fills the ant’s head and body, causing the muscles to atrophy; it also attacks the ant’s central nervous system. The zombie-ant walks randomly, eventually falling to the leafy understory area—a cooler, more moist spot perfect for the fungus to thrive. 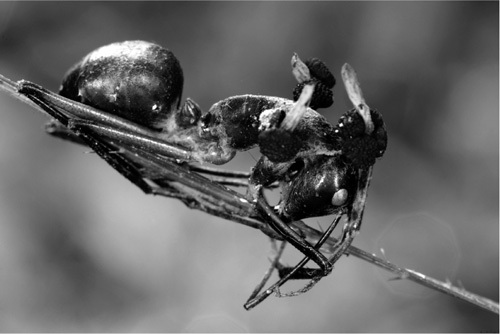 The fungus continues its assault until the ant is dead, eventually growing a fruiting body through the ant’s head—releasing more spores to be picked up by another ant. It took until 2012 for researchers to figure out why the entire ant colony is not destroyed by the zombie-ant fungus. It turns out that a parasite fights the fungus—in fact, it’s yet another fungus! Sometimes ants can be infected by a fungus that eventually kills them and uses the insect’s body for nutrients.